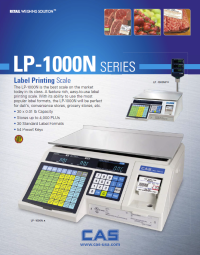 The LP-1000N is a feature rich, easy-to-use label printing scale. With its ability to use the most popular label formats, the LP-1000N is perfect for Deli's, Produce, Supermarkets, Bakeries, Convenience Stores, & Grocery Stores. Optional Fish Pan for the CAS model LP-1000N and LP-1000NP Label Printing Scales.Dimensions 17"..
RS-232C 25 TO 25 PIN Cable for the CAS LP-1000N and LP-1000NP Label Printing Scales. (Cable for Scale.. Replacement RS-232C TO 9 PIN Cable for the CAS LP-1000N and LP-1000NP Label Printing Scales. (Cable f..